A good read for Valentine's Day, too. It could be any gift, not just one for Christmas. THAT GIFT! is a short story of approximately 5400 words about the love between a husband and wife. Have you ever received an unwanted gift from someone you love? What if the giver considered it a very special gift? Thirty years later, a wife's reaction to such a gift changes from disappointment to pure joy with a sudden realization. A husband's lack of finesse grows into a tender display of his love. Anyone in a loving marriage of many years will identify with this heart-warming story. You may, perhaps, want to share it with someone who has not yet been married for so long. Happy Valentine's Day! This was a Christmas story, (not one about Valentine's day), but it holds true for ANY gift giving occasion. This story is extremely short, 23 pages, but it has a very important message in it about love. 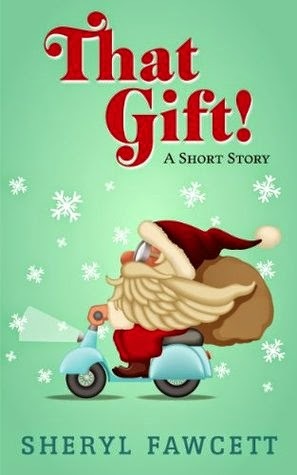 This story is about a husband and wife and their gifts to each other throughout the years at Christmas, and one gift that was such a huge disappointment to the wife, one so bad she ends up crying when she was alone where no one could see her. What neither of them realize at that time but do realize it later over the years is that that gift was a true gift of love. It was truly from the husband’s heart. HE chose that gift. HE thought of his wife when he chose it, and it gave him such excitement to give it to her that he thought she would love to get that gift. He never even gave it a thought as to ‘what’ the gift was. He was giving her a piece of his heart, a ‘gift of love’. Thirty years later the wife is remembering that gift. She realizes that gift was truly a gift of love from her husband’s heart. No other gift he had given her over all the years since even compared to the excitement he had had like he did for that one gift he did that disappointed her so. She realizes it was truly 'a gift of love' from his heart. Later that evening as they are sitting outside, the same message is shown to her again, except differently this time! They both remember that gift from thirty years ago together. So this year, if you get a gift that is the worst possible gift you could EVER get, think of who got it to you and the reason behind it. If it is a gift of love, accept that gift from that person who loves you to pieces willingly, no matter how good or bad it is! For it truly is a gift of love, and those don’t come very often at all, no matter who it may be from!